PROSINO is another brand under Sinobaler Machinery Co. Ltd,, and it was established for our production line of shredding and granulating equipments. 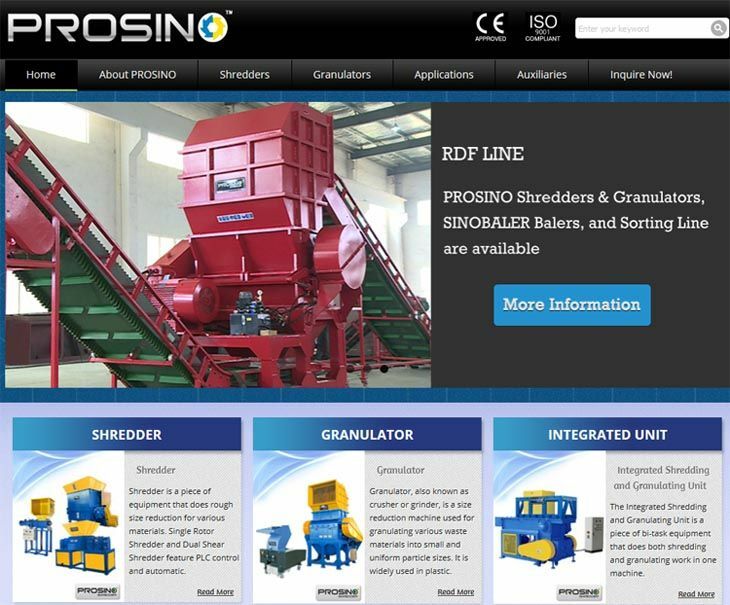 The website www.sinoshredder.com for PROSINO range of products is recently updated with higher richness in both product selection as well technical literature. You are very welcome to take a visit and contact us if having a demand for a shredding machine. PROSINO range of product is quite diversified, including single-shaft shredder, dual-shaft shredder, granulator/crusher, and shredding & granulating integrated unit, capable for handling plastic, paper, wood, rubber, metal drum, e-waste, textile etc. You can always find a proper PROSINO machine to fit your shredding or granulating need. Shredder and baler are very often used together in a production line, no matter in normal recycling line or in RDF line. In such lines, shredders play important role of cutting large-sized or high-hardness recyclable material into smaller size (usually more than one shredder or granulator are used in this step, doing both primary shredding and secondary shredding respectively). The small scraps from the output of shredders are then delivered through conveyors or blown by cyclone system into baling machines to be compacted into dense bales, reducing transportation and storage space. For recyclable traders and dealers, material in soft form such as paper, textile, usually is loaded into a baler for direct baling. However for hard, stubborn and large hollow material e.g. cardboard tube, printer scrap, drum, it is very necessary to shred it first before baling, otherwise the baling machine will get damaged quickly or the bale density will be too low. Contact us today to get an optional solution for your recycling project.